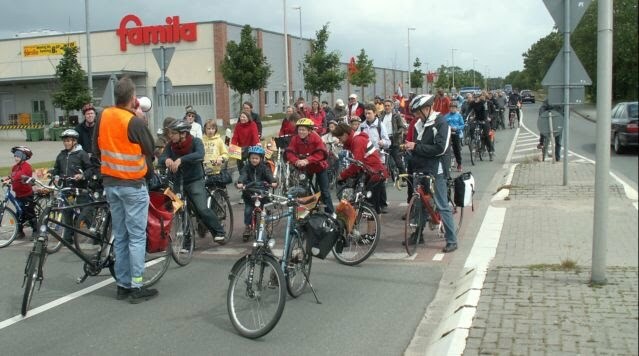 Thousands of cylists of every age reclaimed the streets in Hamburg and around for a better cycling climate in the metropolitan area. 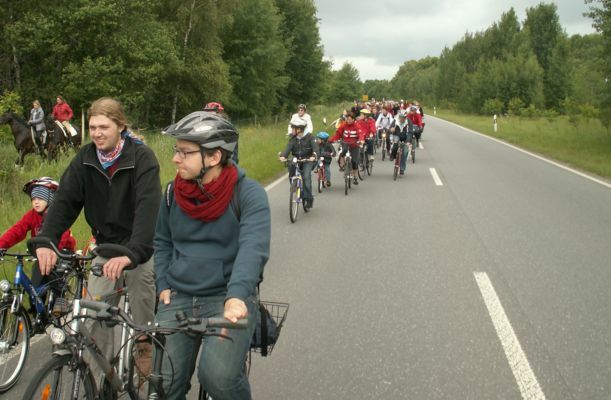 About 50 raindrops couldn´t annoy the participants during several hours on cycles for the Fahrradsternfahrt. 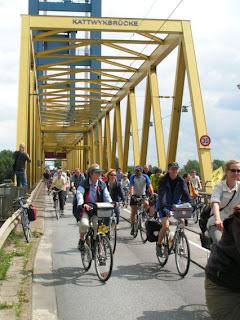 For many of them it was a yearly ritual, for others a relief not to use the badly cycle tracks, others liked the sociability among other fellow sufferers. 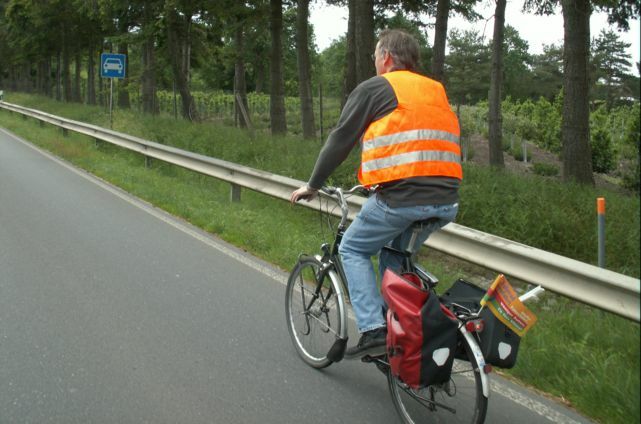 The motor vehicle road - this seven kilometers are usually not open for cyclists. 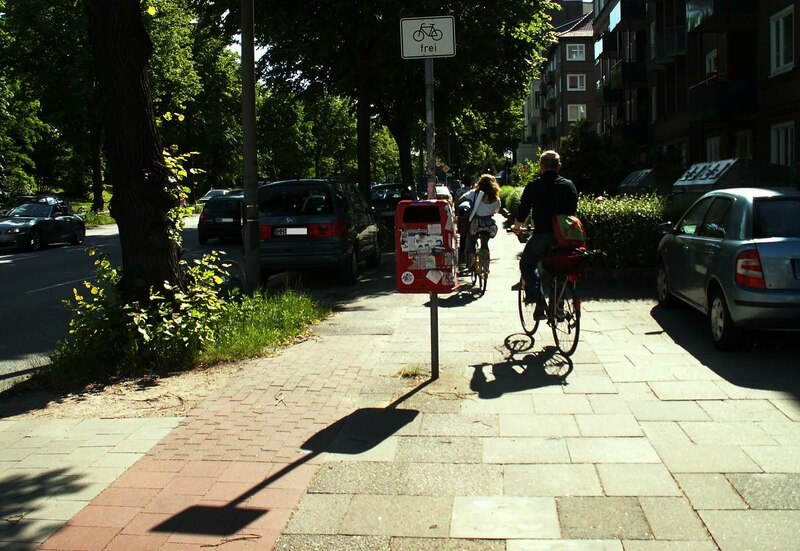 Who remembers the time when cyclists had to use the tiny sidewalks in Flurstraße? Hamburg goes a big step towards European Green Capital. 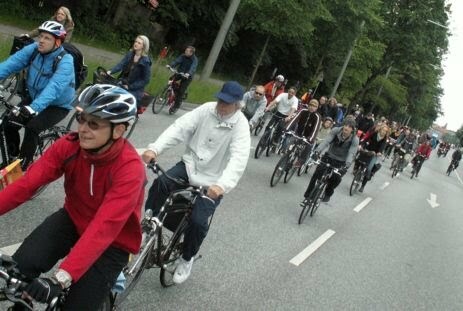 Today the City of Hamburg decided to give cyclists more opportunities to cycle on cycle lanes. 12 km of cycle lanes will be marked on the streets for better cycling. 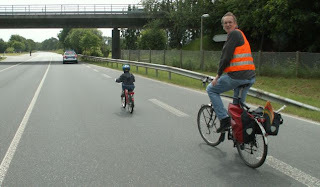 In several streets cycle lanes will replace unusable oldfashioned cycle tracks (see on picture former cycle track between tree and curb in Hammer Steindamm). 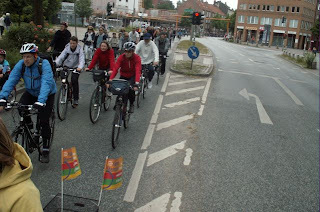 Cycling experts from all over the world will meet in Copenhagen next week from June 22nd to June 25th at Velo-city Global 2010 conference. Copenhagen´s cycle culture will be in the spotlight for all cities as an example of a community that has the strong will to promote cycling. 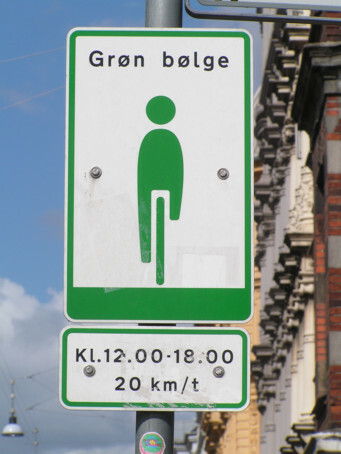 From green waves to green cycle routes, from excellent cycle tracks to cargo-bike garages, from swept cycle tracks in winter to bicycle account, Copenhagen shows a lot how cycling can be made safe, comfortable and popular. 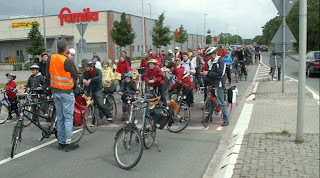 Lot´s of events will take place around the conference, such as a cargo-bike race. Hamburg´s steps to become European Green Capital are small. 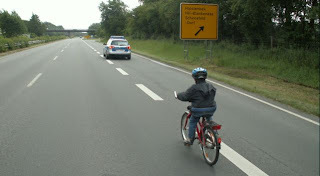 However a new example is given by the little white traffic sign in the street Beim Schlump. 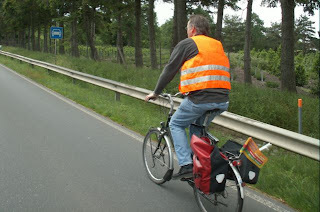 Since the year 2005 cyclist have the choice either to use the cycle track, as fare as it is possible, or to use roadway. The blue traffic signs with the white cycle picture had been taken away five years ago. Now since a few weeks cyclist have a third choice. 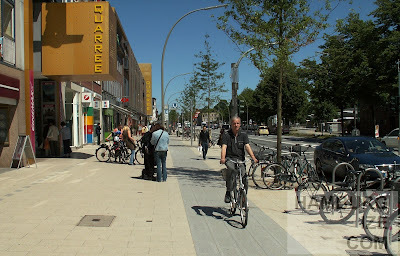 They are allowed to use even the sidewalk next to the cycle track. 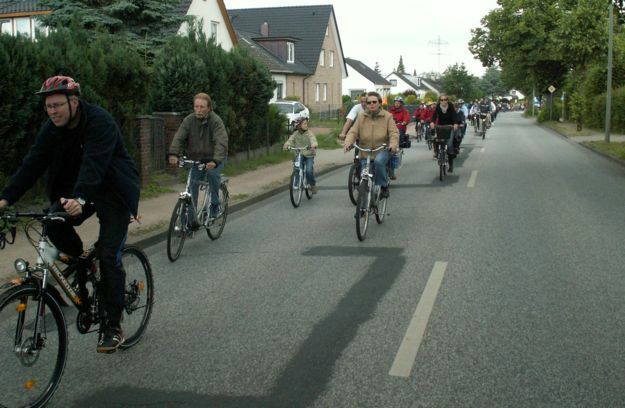 The way Hamburg has choosen to push the cycle traffic is different compared to other cities. 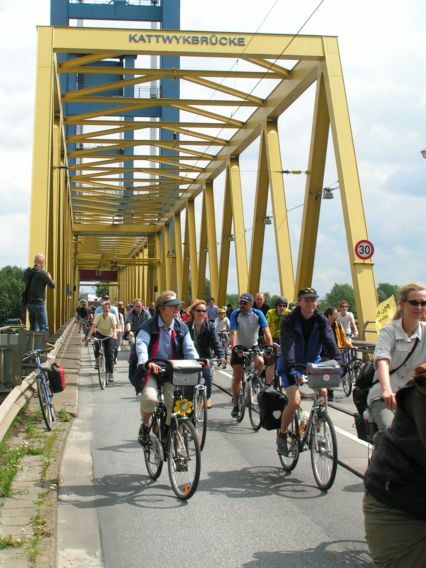 Hamburg does not reduce the space for car traffic, but Hamburg gives the cyclists more freedom. 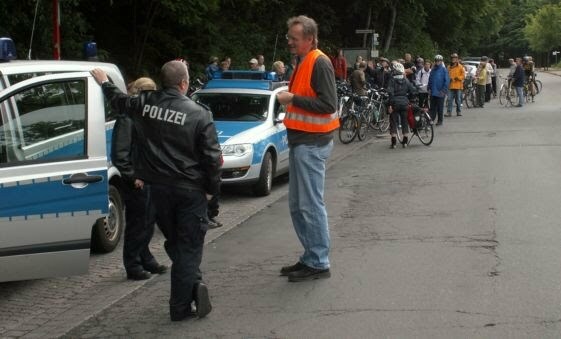 Or in other words Hamburg legalizes the former illegal practice. Because parking for cars has been allowed on the left of the small cycle tracks cyclist keep distance to the cars and cycle on the sidewalks. Not the best idea for pedestrians. But the gift to the cyclists is a little tricky. The big freedom has several exceptions. At the next intersection with traffic signals cyclist are no more allowed to use the roadway or the sidewalk. 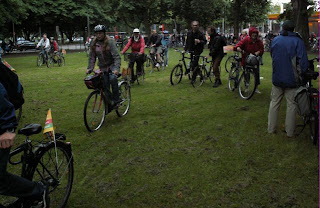 There they are forced to go back onto cycle tracks. 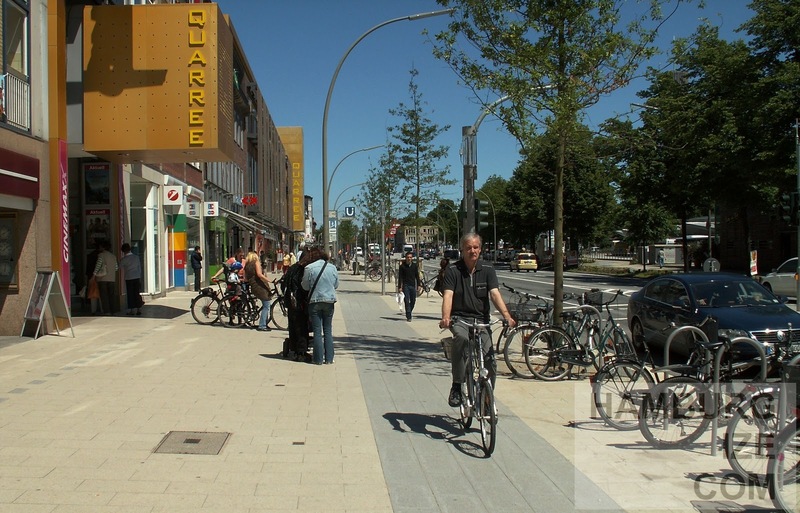 On Friday Hamburgs mayor Ole von Beust will open the new Business Improvement District (BID) in Wandsbek with it´s redesigned cycle tracks. For a period of eighteen months cyclists had to keep clear of Wandsbek Markt while the cycle tracks were interrupted. For cyclists the authorities did not offer a way along the busy main road in the center of the district of Wandsbek. Cycle tracks have changed it´s color from ordinary hamburgish red to fashionable light dark gray. 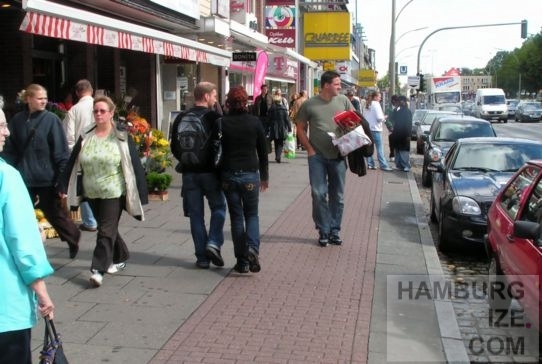 For some parts of Wandsbek Markt the sidewalks have become wider, and even the cycle tracks are wider than before in some parts. Hopefully in future time cyclists won´t get in conflicts with pedestrians like before. 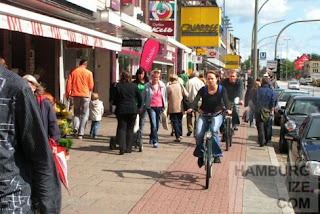 Lot´s of cycle racks have been implemented and invite to visit the shopping center by cycle. 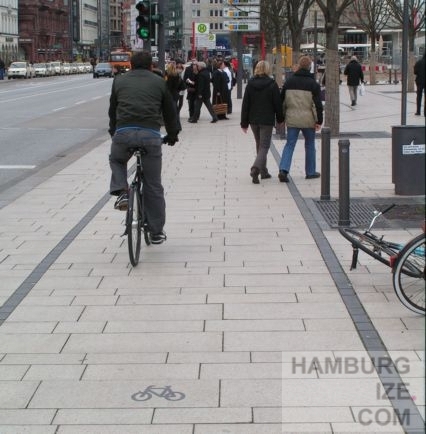 In the first draft the planners suggested narrow and invisible cycle tracks in the same design like those at the famous Jungfernstieg near City Hall. 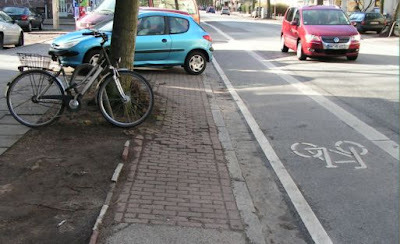 The builders couldn´t be convinced to use cycle lanes. At least the cycle tracks became half visible and wider than in the first sketches. The Wandsbek BID is second big one in Hamburg after Jungfernstieg where the investors - here the owner of the stores - pay for the new sidewalks and cycle tracks and therefore decide about the dimension and design of the cycle infrastructure. 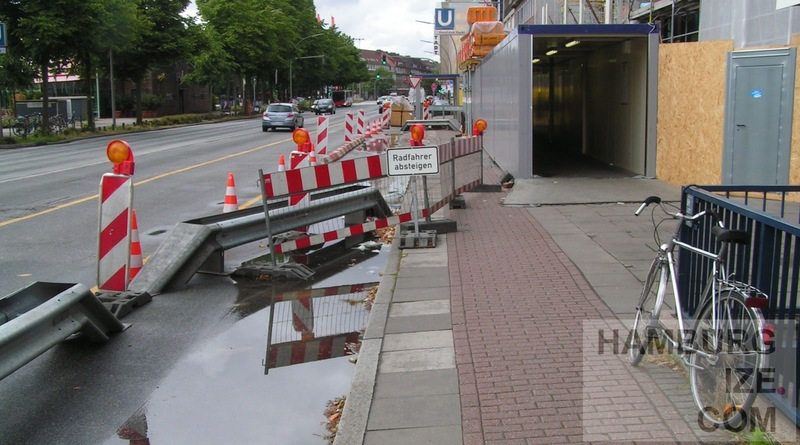 Under construction: No way for cyclists, very common in Hamburg. On the traffic sign "Cyclists get off"
One of the most important events for cyclists in Hamburg will be the Fahrradsternfahrt next weekend. More than 10,000 cyclist will start from all over the metropolitan area to join at the Alster lake in the middle of Hamburg. They will show up for a different traffic policy in Hamburg.